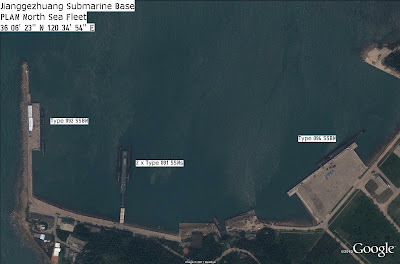 A recent Google Earth imagery update indicates that the Chinese Type 094 SSBN may have reached operational service with the North Sea Fleet of the PLAN. 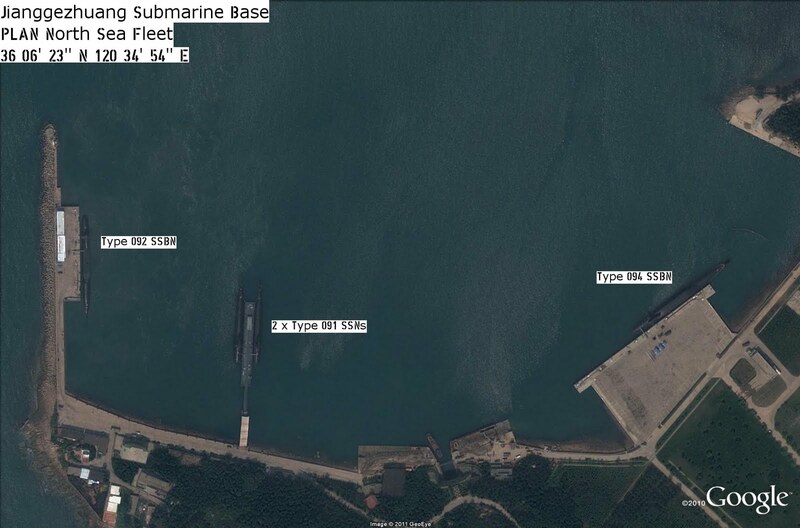 The imagery, captured in August of 2010, decpicts a Type 094 SSBN dockside at Jianggezhuang Submarine Base near Qingdao. Previously, the sole operational Type 094 hull was reportedly based at a submarine facility on Hainan Island with the PLAN's South Sea Fleet. At least three Type 094 hulls have been constructed, with one based at Hainan and two others remaining pierside at Huludao in imagery dated March of 2010. A Type 094 SSBN has been sighted in imagery at Xiaopingdao SLBM test facility as recently as April of 2009, likely in conjunction with JL-2 SLBM trials. The presence of a Type 094 hull at Jianggezhuang rather than Xiaopingdao indicates that the hull is operational with the North Sea Fleet. The bulk of China's nuclear submarine force, including the sole Type 092 SSBN, resides at Jianggezhuang. The Type 092 was recently noted in imagery to be undergoing refit or repair using the installation's drydock, occupying the drydock between 2005 and 2007. Just a few days after this posting was released, on March 28, 2011, another image update came out showing this location. One of the Type 091 seems to have left port. I haven't found it resurfacing anywhere, but I'm still on the look out. Good, and extremely significant, fine with the Type 094 though.